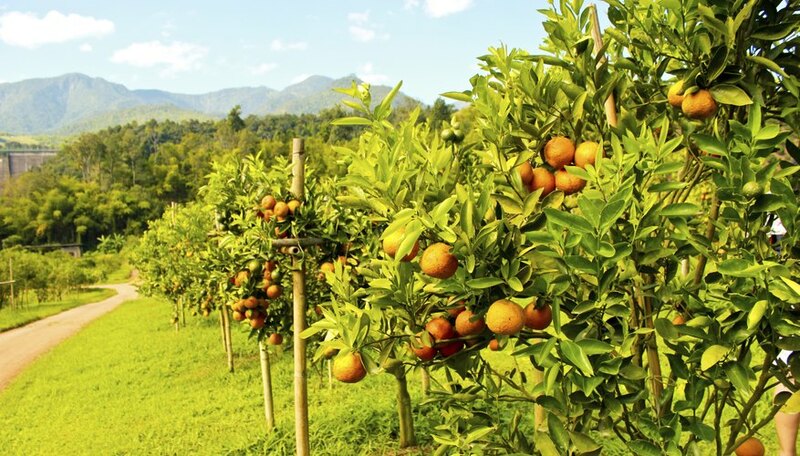 If you've decided to plant a fruit tree or to start a home orchard with several trees, choosing the best time for planting can be a key to success. You have a few options depending on the climate in your area: Spring planting works well in most locations, but you can also plant in early fall if your winters aren't too severe. The type of tree you start with -- container-grown or bare root -- can also affect your planting schedule. In all parts of the United States, you can plant container-grown fruit trees in spring. Plant as early as possible, whenever your soil conditions allow digging but air temperatures are still cool. By planting in early spring, the tree has time to put out new roots before the air temperature rises and stimulates dormant buds to swell and open. If your area is subject to sub-freezing winter temperatures, wait until the ground is no longer frozen and you can dig easily. Pick a time when the soil is lightly moist but not soggy. Squeeze a clump of soil in your hand; if it holds together but doesn't release any water, it's suitable for planting. Fall is also a suitable time to plant potted fruit trees in certain parts of the country, where winter temperatures are moderately cold but sub-freezing periods are short or rare. For example, fall planting usually works well in U.S. Department of Agriculture plant hardiness zone 10, where winter temperatures fall as low as 30 degrees Fahrenheit for short periods. Planting during cool fall temperatures minimizes stress on a young tree, while allowing enough time for roots to grow before winter arrives. The tree enters dormancy over winter, then puts out strong new growth the following spring. Fall planting also lets the tree avoid the hot, drying temperatures of summer that a spring-planted tree encounters. Fruit trees are often available from nurseries or garden centers as "bare root" specimens: They're unpotted and dormant, with no green top growth. Whether purchased in spring or fall, these trees must be planted as soon as possible to avoid drying of the roots, which can jeopardize the tree's ability to grow. Wrap the roots in a wet towel until planting and set the tree into the garden within a day or two of purchase. If planting must be delayed, you can temporarily "heel in" the tree for a week or two by digging a shallow trench, covering roots with soil or compost and keeping them moist until planting. Plant a fruit tree in a hole that's about twice the size of the root ball or, for bare root trees, the root cluster, keeping the plant at the same depth as it was planted previously. If it's a grafted tree, ensure that the grafting scar in 2 to 4 inches above the soil, orienting the notch that protrudes at the graft union toward the northeast; this minimizes sun-scald. Partially back-fill the hole with compost-amended soil, tamp it down, flood the hole with water to remove air pockets around the roots, then finish filling the hole and water the tree again. Water the tree every few days for the first several weeks, then provide supplemental water as needed, aiming for at least 1 inch of water weekly, including rain, during the first few seasons.